Chances are you may not have heard of the VA Cash-Out Refinance program, but if you’re looking for a great alternative to a Home Equity Line of Credit (HELOC) or standard Home Equity Loan, then the Hawaii VA Loans Equity Plus Refinance is the right choice for you! The HVL Equity Plus Refinance program is different than a regular home equity loan, which is a second lien against your property. You’re essentially replacing your existing mortgage with a new loan that allows immediate access to cash using your home equity with easy fixed-rate monthly payments. The HVL Equity Plus Refinance may be preferable to a HELOC which has unpredictable variable rates. Another benefit of the HVL Equity Plus Refinance is that the interest on your VA cash-out loan may be tax deductible, unlike the interest on a HELOC or equity loan, which could save you even more money. Over the last two years, VA cash-out refinances have grown in popularity, making up almost 20% of all VA loan transactions. Finance up to 100% of the home loan-to-value (LTV). We can lend on up to 100% of the value of the home to the county maximum loan amount ($721,050 on Oahu). We can go higher, but keep in mind, the equity requirement will increase as we go above the county loan limit. Furthermore, you can use that money to pay off any type of home loan with a 2.15 – 3.3% funding fee. Even if you have a conventional, FHA, or USDA loan, the Hawaii VA Loans Equity Plus Refinance is an available option for you if you meet the basic requirements. 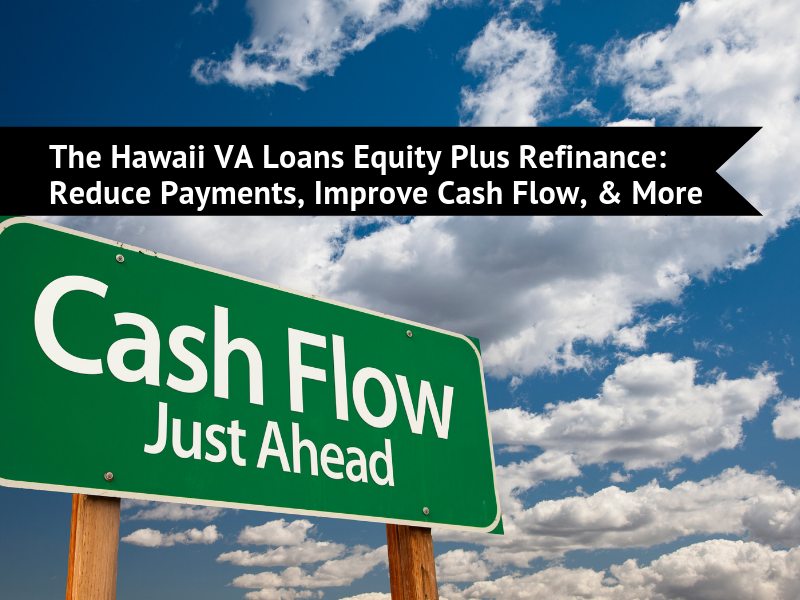 If you’re interested in the many benefits of the Hawaii VA Loans Equity Plus Refinance program, we’re ready to help! Contact Hawaii VA Loans at 808-792-4251 to speak with a VA Loan Specialist or online at https://hawaiivaloans.com/contact/. The Hawaii VA Loans Equity Plus Refinance requires that you already have a mortgage on your property, but if you own your home free and clear and no longer have a mortgage, you can always contact us to research other options to use your home’s equity as well!